I don't know which subforum to put this under, as it sort of falls under collection, but carries over to battling. I have the "collect rare ocd" and are of course aiming to collect all possible wild pets. Right now, I collect any rare and move on. I don't do much PvP battles, as I only have 3 level 25's at the moment, and because of that I'm also stuck at Outland tamers. That is fine, for now I enjoy the casual aspect of collecting and battling. However, when lurking in the forums, I see a lot of you talking about "I finally found the rare, but it was the wrong breed" or "I've been searching for the right breed drop for hours". So my question is this: where do you find all this knowledge, and where do you apply it? I mean, I know where to look for breed types, but I still don't have a good idea of what breed a certain pet (of a certain group) should ideally be in. I want to do PvP when i slow but steadily level up my pets to 25, but right now I feel like a noob when it comes to which pets are awesome for PvP to begin with, and the breed factor on top of that just makes me dizzy. Lunaire wrote: where do you find all this knowledge, and where do you apply it? Not all pets come in a variety of breeds. If you look up a pet, you can flip through the breeds available for that pet in the Battle Info tab. The Fledgeling Nether Ray only has one breed. I want to do PvP when i slow but steadily level up my pets to 25, but right now I feel like a noob when it comes to which pets are awesome for PvP to begin with, and the breed factor on top of that just makes me dizzy. I'm probably the worst person to talk about this. I haven't done pet PvP because I'm not a fan of any PvP, but I'll have to PvP next patch to get a pet. From my point of view, for most pets, breed doesn't matter. I say this in regards not only to pets that have lots of "repeats", but for pets in general. Why? Because unless you're planning to get super serious about PvP, I'm gonna guess that you'll be like me and try to field the best team possible with your favorites or pets that seem to do well specifically for PvP. Beyond that, I'd say go for the breed with the best stats, and consider abilities, since higher stats just mean the pet is that much more effective. For example, with that nether ray, if it did have other breeds, you wouldn't want it to be S/S because you want the extra hit for last attack. Similarly, you wouldn't want a slow bunny, since they have a move for an extra attack at high speed. If you do want to get super serious for PvP, then you'll want to have different breeds of pets for countering other teams depending on what you're seeing at the time. Even still, I don't think breed will have a huge impact, since it's still going to be luck of the draw on what you face, sort of like 3v3 arenas. If you keep seeing the same team, then you may want to adjust to have better pets. But yeah, the thing about breeds is to have one that matches the ability set you want to use. Extra attack if fastest? Then you want a speedy breed. Hits harder if slow? Then a low speed breed. Lots of healing moves? High power as healing spells scale with power. Lots of defensive moves? Go for high health to help soak damage. Lunaire wrote: From my point of view, for most pets, breed doesn't matter. I say this in regards not only to pets that have lots of "repeats", but for pets in general. Why? Because unless you're planning to get super serious about PvP, I'm gonna guess that you'll be like me and try to field the best team possible with your favorites or pets that seem to do well specifically for PvP. There are some pets where this may be, but there are also some that you want to be a specific breed, because they are explicitly worse if they are not that breed. Best example for me is the Flayer Youngling, it comes with a variety of breeds (I think all 10 possible breeds), but theres only one (s/s) that is able to easily dominate Yon (the Tamer in Kun-Lai Summit), he takes out the rabbit and the goat by losing about 1/4 to 1/3 of his life, while any other breed has it a lot harder or even depends on luck. Another feature would be optimization (mostly against tamers, where you know the stats anyway), when you need to be the first to go, obviously you just need that 1 point speed more - so you may take that (s/p) or (s/b) instead of the obvious (s/s) and so may do more damage at the same speed. PS: there are some pets that have many different "types" (moths, frogs, snakes, cats ...) but not all of the different types have the same breed IDs or even the same breed ID set. Most of this "notunique" pets can be collected without any of them being the same - breed ID set or breed ID. example: I think there are a total of 14(?) moths with the same moveset - and its possible to have 12(?) of them being "unique" (have to look ingame but not possible atm). In fact there are a lot less pets that are "identic" than one might think of. Spary wrote: There are some pets where this may be, but there are also some that you want to be a specific breed, because they are explicitly worse if they are not that breed. Well, yes. I don't disagree with that. Partly because of the fact that certain breeds simply have a lower stat total and partly because you want certain things from certain pets. Some pets you want them to be as fast as possible, or just have a speed higher than X, in which case you can chase the breed you want for that fight (if you need to). However, there are enough pets that you really only need to worry about breeds on favorites or ones that you plan to use in fights. But even then, when there's an array of a type, you may not even have to worry even then. For example, I've got an array of rabbits, and I use a different one for the Payne fight than I do for the Earth Spirit fight. I didn't have to chase breeds because there were enough of them that at least one had what I was looking for already. Although, that's probably good luck on my part. That's more about favorites than a need for a specific breed. I'm not a fan of the flayer, and don't use it in any of my strategies for tamers. If you like the flayer, then you'll want a specific breed to do certain things and that's fine. For me, on Yon, the Emerald Whelpling simply dominates the entire fight, and many times I have to purposefully swap it out or let it die so I don't accidentally kill the goat. I didn't worry about breeds while collecting since I was more focused on whether I had a pet or not, then rare or not, so my strategies for the PvE stuff probably reflect that. But with the pets I have, by whatever luck, I've got all the tamer dailies down to a boring routine. Which is what leads me to the conclusion that it's more for PvP that you'll want to tweak stats to optimize more because you'll be facing thinking opponents who are going to try to wring out every possible advantage they can. this is how i do pet breeds it may be wrong, but what i look for is a pet with good health pool. then i look at there abilities. lets say any of the pets that have the if you attack first you get x ability. so then for that pet i will look for health and speed with a pretty decent attack. other pets i will look for the most attack i can get out of them. that is just the way i do it. Is there a way to sort the pets by possible breed? Say for instance I want to see every pet that has a 4/14, 4 or 14 breed available. This would save me so much time instead of manually checking every individual pet. I use http://petsear.ch/ along with battle pet breedID. 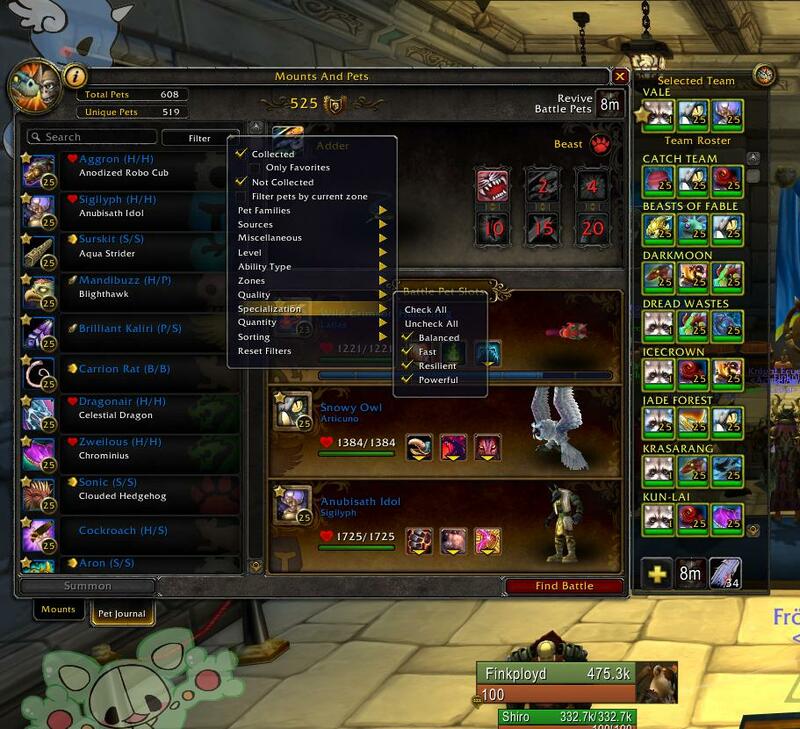 With that addon whenever you hover over a pet you can see all possible breeds along with their stats at level 25. I also just picked up an addon for more filter options and it allows you to search your own in game collection much more thoroughly. For instance I can search by rarity, level sub section, or even breeds. The only let down is you have to already have the pet to search breeds like this. Here is a few screenshots. My favorite feature of this addon is to search by current zone :3 It makes rare hunting a breeze. Finkployd wrote: I also just picked up an addon for more filter options and it allows you to search your own in game collection much more thoroughly. For instance I can search by rarity, level sub section, or even breeds. The only let down is you have to already have the pet to search breeds like this. Here is a few screenshots. That addon sounds interesting. What is its name and where can I download it? If you look at the breed guide's overview, you could see that the total amount of stats decreases, the more stats are present in a breed. Therefore "pure" breeds, especially H/H and P/P, are often the better choice than, say, P/B. - being magical, it can't take more than 40 (35) % of it's max HP in a hit. the higher the oozeling's max HP, the more damage it takes before triggering the ability. - it has a self-heal that scales with damage (absorb). the higher it's damage, the higher it's self heal. i won't get into details of the other skills because these are the skills of interest here. now, what can we conclude from this? to be optimal, we want a P/P oozeling. a H/H oozeling would take more damage in a bursty hit and heal less overall. we don't need to be very speedy, so S/S won't help much. clearly a high power breed is optimal here. if you wish to determine ideal breeds, take the pet's skillset into account. sometimes, you want the highest power, but also whenever breed doesn't matter, high power is the way to go because it can make fights shorter. high health can be interesting in combination with stuff that scales with max HP, like the humanoid bonus or explode-like abilities. it is also great for outlasting strategies. Speed is the trickiest of all stats, because more than one speed point above the enemy is essentially wasted (but not always either ). Generally speaking, you want the highest speed with speed related skillsets, because the enemy might use spells that increases their relative speeds. Speed is also very interesting in combination with spells like burrow because you can use them to react to the enemy's two-round spells, negating them. Another thing you'd like to look at is similar pets that share abilities. As an example, if you already have a S/S mongoose, then you might want a P/S mongoose pup for greater variety. Technically, you don't need every pet to be the ideal breed if you already have a good one with that skillset. Personally, I'm still going for perfection, but this is just a time consuming hobby of mine. However, going for a little variety, like in my mongoose example, might still be a good idea. Who knows, maybe one breed might turn out very good and in that case i'd rather already have it in my book than having to go back and farm for it. But that's just personal preference too. Kpb321 wrote: That addon sounds interesting. What is its name and where can I download it? Looks like he means PetJournal Enhancer. A great addon i highly reccomend too. You might want to take a look at the Addons section of the site. There seems to be an abundance of replies telling you where to go to figure out a pets breed so i feel like i can help more by telling you one of the better ways imo to decide what breed to use. First i look at what type i'm getting for example if its a beast i usually go for HP as its racial is more dmg under 40% hp so i want to keep it alive as long as possible in that 40%-dead although i have seen tons of ppl get power beasts to do even MORE dmg under 40%. And lastly i think about how i am going to use it in a team a lot of ppl look at a pet and think about its abilities solo where as for a good comp you want a pet that plays well with your other pets. So normally a speed pet might work on its own,in conjunction with your other pets in that team a hp one might work better.